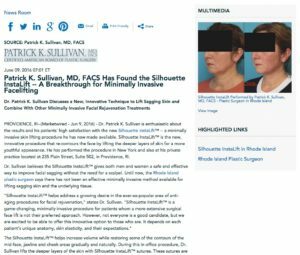 Patrick K. Sullivan, MD, Has Found the Silhouette InstaLift – A Breakthrough for Minimally Invasive Facelifting - Patrick Sullivan, M.D. Dr. Patrick K. Sullivan Discusses a New, Innovative Technique to Lift Sagging Skin and Combine with Other Minimally Invasive Facial Rejuvenation Treatments. Providence, RI — Dr. Patrick K. Sullivan is enthusiastic about the results and his patients’ high satisfaction with the new Silhouette InstaLift™ – a minimally invasive skin lifting procedure he has now made available. Silhouette InstaLift™ is the new, innovative procedure that re-contours the face by lifting the deeper layers of skin for a more youthful appearance. He has performed the procedure in New York and also at his private practice located at 235 Plain Street, Suite 502, in Providence, RI. Dr. Sullivan believes the Silhouette InstaLift™ gives both men and women a safe and effective way to improve facial sagging without the need for a scalpel. Until now, the Rhode Island plastic surgeon says there has not been an effective minimally invasive method available for lifting sagging skin and the underlying tissue. The Silhouette InstaLift™ helps increase volume while restoring some of the contours of the mid-face, jawline and cheek areas gradually and naturally. During this in-office procedure, Dr. Sullivan lifts the deeper layers of the skin with Silhouette InstaLift™ sutures. These sutures are made from glycolide/L-lactide (PLGA), a biomedical copolymer that is well absorbed by the body and stimulates the production of collagen, which aids in healthy skin renewal for natural-looking results. He notes that the treatment has been comfortable for his patients and typically takes about 45 minutes, and the results can be visible immediately and improve over a three-month time span. Dr. Sullivan has been particularly happy that he has been able to successfully combine the Silhouette InstaLift™ with other minimally invasive treatments he performs to effectively treat specific areas, including facial laxity, wrinkles, jowls, fatty collections and areas of lost volume. Dr. Sullivan’s specialty is giving his patients artistic natural-looking results, and he is invited to teach about this in plastic surgery meetings all over the world. He finds it very exciting to be able to use new technological advances in his effort to help more people get the kind of treatments they are looking for. Dr. Sullivan is division chief of cosmetic surgery and is on the faculty at Brown University’s Alpert School of Medicine in Providence, Rhode Island. He specializes in cosmetic surgery of the face, neck, eyelids, breast and body. He is Board Certified by the American Board of Plastic Surgery in Plastic and Reconstructive Surgery. He has been recognized by US News & World Report as being in the top 1% of plastic surgeons in America, Castle Connolly America’s Top Doctors, and voted a Top Plastic Surgeon in Rhode Island Magazine 2001-2016. Dr. Sullivan is available for interviews upon request.